We’d love your help. Let us know what’s wrong with this preview of Unstuffed Video Study by Ruth Soukup. Ruth Soukup, New York Times bestselling author and popular blogger, knows all too well how overwhelming it can feel to have a life filled with too many things. 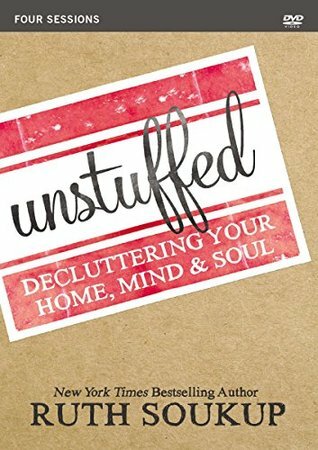 In this four-session video study (book sold separately), Ruth uses personal stories, biblical truth, and practical action plans to inspire and empower you to finally declutter not only your home but your mind and so Ruth Soukup, New York Times bestselling author and popular blogger, knows all too well how overwhelming it can feel to have a life filled with too many things. In this four-session video study (book sold separately), Ruth uses personal stories, biblical truth, and practical action plans to inspire and empower you to finally declutter not only your home but your mind and soul as well. This DVD also includes a free introduction video as well as a printable study guide for groups and individuals. To ask other readers questions about Unstuffed Video Study, please sign up. Through her top-ranked Do It Scared® podcast and her wildly popular Ruth Soukup Weekly newsletter, which reaches more than a million weekly subscribers, she provides easy-to-follow guid New York Times bestselling author, speaker, and entrepreneur Ruth Soukup is dedicated to helping people break through fear and overcome the obstacles that stand in their way so that they can create a life they love.